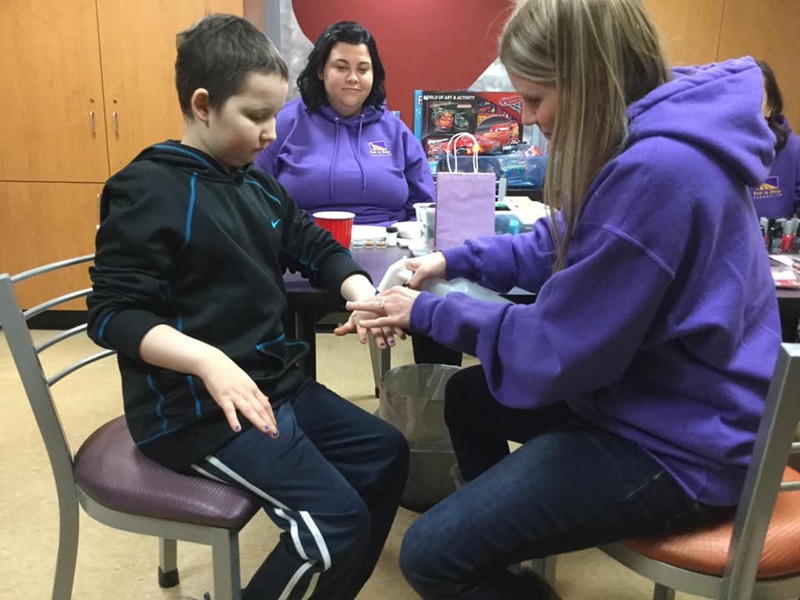 Our Snowflake party at the Ronald McDonald House of Rochester, MN consisted of face painting, nails, makeup, tiaras, snowball toss, snowflake crafts and snowman making with the ever so popular toilet paper. We had 7 volunteers and Miss Teen MN USA on site to help facilitate the stations. We saw 7 girls, 3 boys, and approximately 10 parents. Though we only saw 3 boys, they were the most excited and wild. They loved the snowball toss game which, at times, turned from a toss-into-a-hole to a toss-at-their-parents. The girls loved the crafts, makeup, nails and tiara stations. In addition, one of the children convinced dad to also receive a little face paint treatment, with a beautiful, woman-like painting of his eyebrows. That family was a ton of fun. Near the end of the event, the boy of the family received a special face painting from Miss Teen MN USA. The logo of his favorite team, the Kansas City Chiefs, was painted on the side of his face. It just so happened that Miss Teen MN USA knew the children of the team’s owners, so there was much to talk about. It turned out that a family with a young girl that we are currently working on gifting a family package was there, and it was nice to meet the parents in person, as well as spend time with the girl who has no idea what we’re up to. We pretended to not know about her favorite sports, teams and players while visiting with her. We look forward to spoiling her soon!